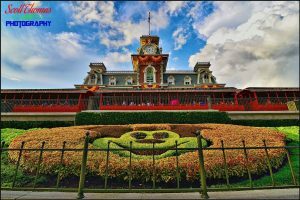 Photographer Scott Thomas shares some of his favorite images around the Disney Parks in his weekly "Disney Pic of the Week." This week he wishes one and all a very Happy Thanksgiving! For eons, our planet has drifted as a spaceship through the universe. — Walter Cronkite version from 1986-1994 Spaceship Earth on an Autumn day in Epcot.Nikon D700/28-300VR, 1/125s, f/16, ISO 280, EV 0, 150mm focal length. I have been riding Epcot’s Spaceship Earth since 1983 and have heard every narrator for the attraction. By far, … Continue reading "Clouds and Spaceship Earth in Epcot"